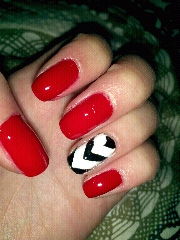 Ever since I was little I always LOVED to paint my nails. But only til recently have I really had a passion for the art that goes behind them. At first I started off with just taking a few pictures here and there with my phone, and it's become almost a weekly post to my facebook page. After a while, friends had suggested to start blogging about it. And that's what I did.